Some diseases or health disturbances do not fit into the other health topic sub-categories and therefore stand for themselves in their own sub-category. For example an apoplexia or a broken bone have nothing to do with infectious diseases or parasites. I thought it would be better to build the sub-category "other diseases" for all these topics you can find here. 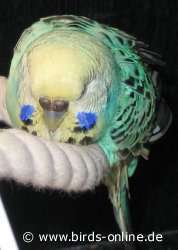 The photo on the right shows a completely devitalised budgie who could hardly stand on its perch due to severe illnesses. On the one hand the bird suffered from a heart insufficiency and on the other hand the hen had been eggbound before and due to this her feet have become paralysed. I hope you will find the information you are looking for in the health section of my website "Birds Online". But please always keep in mind that reading the information given on this site should never be a substitute for visiting an avian vet!